Canoeing on Little Grassy Lake. At Camp Carew, We seek to help people deepen their awareness of God, each other and the natural world by providing a camp program and a setting in which personal growth can take place. Our hope is that campers will strengthen their own sense of personal worth as well as their relationship to Jesus Christ and to others. Activities at Camp Carew are directed toward Christian community. Through group living in the small unit, campers, and leaders are challenged to work, plan, play, study, sing, and worship together. Horseback camp teaches campers the basics of horseback riding and equestrian care. It features regular camp activities and at least four hours of horse activities each day. The camp is for both Junior- and Senior-High campers. Horseback camp is $365 per camper. Scholarships are available. Focusing on music, art, and drama and allows campers of all levels to be creative while having fun. Activities include drawing, painting, singing, performing, Bible study, and a variety of crafts. MAD camp is $250 per camper. Scholarships are available. 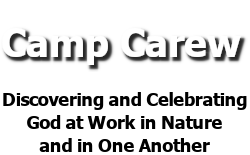 Counselors-in-Training Camp teaches the responsibilities and duties of being a camp counselor. To qualify for this program, you should be entering the 11th grade or above, be an active member in your congregation, demonstrate leadership skills, and be able to volunteer at least one other week during the summer. CiT camp is $155 per camper. Scholarships are available. Leaders-in-Training Camp is the second part of our leadership training program. To qualify, you should have attended a session of Counselors-in-Training and be able to volunteer at least one other week during the summer. LiT camp is $155 per camper. Scholarships are available. Each General Camp offers a little bit of everything for each camper. Activities include swimming, canoeing, hiking, Bible study, crafts, horseback riding, campfires, exploring, and outdoor living. General camp is $250 per camper. There is an additional $45 fee if horseback riding. Scholarships are available. Gather up you camera and tripod. Experienced photographers will teach you all the ins and outs of photography. Learn to use your camera at its maximum abilities. Learn as we explore and study this fine art. Photography camp is $155 per camper. Scholarships are available. This camp is for High School grade campers. This camp helps campers learn about nature and our environment; how to interact within it and also how to take care of it. Some activities are caving, canoe trips, hiking, special adventure trips, team-building, compass reading, Bible study, and learning basic sailing skills. High Adventure camp is $250 per camper. Scholarships are available. Hiking in southern Illinois' state parks. Shaving cream whiffle ball at Camp Carew. The fire pit in the outdoor sanctuary. Horseback riding at Camp Carew.